Chemung County is a county in the southern tier of the U.S. state of New York. As of the 2010 census, the population was 88,830. Its county seat is Elmira. Its name is derived from a Delaware Indian village whose name meant "big horn". 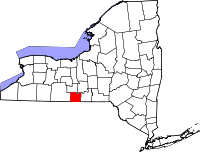 Chemung County comprises the Elmira, NY Metropolitan Statistical Area, which is also included in the Elmira-Corning, NY Combined Statistical Area. Many signs posted along roads in Chemung County refer to the area as "Mark Twain Country," because the noted author lived and wrote for many years in Elmira. For the history of Chemung County prior to its creation by partition, see Tioga County, New York. In 1854, Chemung County was divided and 110 square miles (280 km2) became Schuyler County, reducing Chemung to 410 square miles (1,100 km2), its current size. In the late 1870s, the Greenback Party became prominent in Chemung and nearby counties in western New York. Here it was primarily allied with labor in a critique of capital, reaching its peak in 1878, the year following the Great Railroad Strike of 1877 and the Scranton General Strike in Pennsylvania. There were also strikes that year in Albany, Syracuse and Buffalo, starting with the railroad workers. In Steuben and Chemung counties, Greenbackers were elected to county councils in 1878 instead of Democrats, and others were elected from there and nearby counties to the state legislature, gaining votes of more than 25 percent in several of the Southern Tier counties. It gradually declined after that, due to internal dissension and the strength of the two major parties. According to the U.S. Census Bureau, the county has a total area of 411 square miles (1,060 km2), of which 407 square miles (1,050 km2) is land and 3.4 square miles (8.8 km2) (0.8%) is water. Chemung County is in the southwestern part of New York State, along the Pennsylvania border, in a part of New York called the Southern Tier and is also part of the Finger Lakes Region. The Southern Tier Expressway runs through the County east-west near the Pennsylvania border, between Waverly, New York and Corning, New York via Elmira, New York. As of the 2000 census, there were 91,070 people, 35,049 households and 23,272 families residing in the county. The population density was 223 per square mile (86/km²). There were 37,745 housing units at an average density of 92 per square mile (36/km²). The racial makeup of the county was 90.96% White, 5.82% Black or African American, 0.23% Native American, 0.78% Asian, 0.02% Pacific Islander, 0.75% from other races, and 1.44% from two or more races. 1.77% of the population were Hispanic or Latino of any race. 16.4% were of German, 15.7% Irish, 12.5% English, 11.8% Italian, 7.8% American and 6.3% Polish ancestry according to Census 2000 . Most of those claiming to be of "American" ancestry are of English descent and, in upstate New York, also in some cases of Dutch descent, but have family that has been in the country for so long, in many cases since the early seventeenth century, that they choose to identify simply as "American". 96.2% spoke English and 1.6% Spanish as their first language. There were 35,049 households of which 31.00% had children under the age of 18 living with them, 49.80% were married couples living together, 12.40% had a female householder with no husband present, and 33.60% were non-families. 27.90% of all households were made up of individuals and 12.20% had someone living alone who was 65 years of age or older. The average household size was 2.44 and the average family size was 2.97. The median household income was $36,415, and the median family income was $43,994. Males had a median income of $35,076 versus $24,215 for females. The per capita income for the county was $18,264. About 9.10% of families and 13.00% of the population were below the poverty line, including 18.40% of those under age 18 and 6.80% of those age 65 or over. Before 1974, Chemung County was governed by a board of supervisors. On January 1, 1974, executive and legislative powers were split between a county executive and a 15-seat legislature. All 15 members are elected from single-member districts. In presidential elections Chemung County tends to vote Republican. It voted for George W. Bush in 2004 by a 10.85% margin. In 2008 the margin was much closer, but voters still gave John McCain a 1.23% win over Barack Obama. In 2012 Mitt Romney carried the county by 2.33%. ^ Sharing the Dream: White Males in a Multicultural America By Dominic J. Pulera. ^ Leip, David. "Dave Leip's Atlas of U.S. Presidential Elections". uselectionatlas.org. Retrieved 4 April 2018. ^ "About GST BOCES Bush Campus". GST BOCES. Retrieved 8 May 2013. ^ "Chemung County New York School Districts". NewYorkSchools.com. Retrieved 8 May 2013. ^ "Chemung Valley Montessori School". Go Montessori. Retrieved 8 May 2013. ^ "Elmira Christian Academy". Elmira Christian Academy. Archived from the original on 22 June 2013. Retrieved 8 May 2013. ^ "Welcome-Holy Family Junior High School (Elmira)". Diocese of Rochester. Archived from the original on 9 April 2010. Retrieved 8 May 2013. ^ "Welcome-St. Mary Our Mother School". Diocese of Rochester. Archived from the original on 15 August 2006. Retrieved 8 May 2013. ^ "Notre Dame High School". Notre Dame High School. Retrieved 8 May 2013. ^ "Twin Tiers Christian Academy Home". Twin Tiers Christian Academy. Retrieved 7 Nov 2014. ^ "Arnot Health". Arnot Health. Retrieved 8 May 2013. ^ "Corning Community College Facilities". Corning Community College. Archived from the original on 27 May 2010. Retrieved 8 May 2013. ^ "Medical and Technical Career Training Programs - EBI Career Institute". Elmira Business Institute. Retrieved 8 May 2013. ^ "Our Libraries". Chemung County Library District. Archived from the original on 10 May 2013. Retrieved 8 May 2013. Wikivoyage has a travel guide for Chemung County.